Urban Decay Liquid Liner Eyeliner is designed to last all day and night without smudging. It comes in 14 different shades from black, a shimmering neutral or a sparkling bright color. The bottle itself has been designed for ease of use due to the shape of the lid, it should fit in your hand nicely. The formula should dry quickly for less risk of smudging and should have a subtle shine. I personally love the effect of a liquid eyeliner, but applying it isn't always easy I know, but practice makes perfect. When perfected it looks gorgeous! This liner does sound like a good buy if you are looking for that shiny and glossy style, which is popular for a night town with a bit of glamor. Urban Decay is a well known brand among younger circles, although its products are sometimes a little over priced. Water (Aqua), PEG 75 Lanolin, Propylene Glycol, Beeswax (Cera Alba), Cetearyl Alcohol, Polybutene, Polysorbate 20, Triethanolamine, Shellac, Phenoxyethanol, Xanthan Gum, Methylparaben, Propylparaben, Simethicone, May Contain (+/-): Mica, Titanium Dioxide (CI 77891), Iron Oxides (CI 77491, CI 77492, CI 77499), Ferric Ferrocyanide (CI 77510), Ultramarines (CI 77007), Blue 1 Lake (CI 42090), Chromium Oxide Greens (CI 77288), Carmine (CI 75470), Yellow 5 Lake (CI 19140). To get a more defined line use the very tip of the brush, or if you like a thicker line lay the brush flat. It will look better if you can make the line in one sweep, it takes a steady hand and practice but its worth it for gorgeous eyes. 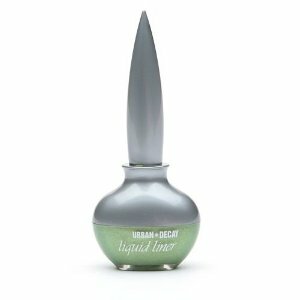 Urban Decay has pulled in good reviews for this liquid eyeliner with most users impressed with the precision and ease of use. However, a few ladies found the brush a little big for small eyes. If you can, try and test it before you buy. This eyeliner is quite pricey at $18 considering some brands cost as little as $10 and can be just as good. Make Up For Ever Aqua Eyes is a is a eye liner and shadow in one. It is a waterproof formula that is designed to resist fading or running. The pencil comes in a wide range of colors, so hopefully there will be a suitable shade to match any skin tone and personality. Ladies from Amazon had mixed comments about Aqua Eyes. Some think its a brilliant formula that stays put all day with no smudging. They also like that its waterproof. Other users seemed to have the opposite effect with this pencil. They found that it ran after a few hours giving them dark circles under the eyes. Some ladies found it didn't go on smoothly and tugged on their skin. I don't know about you but I'm in 2 minds about trying it and it doesn't help that it is a little over priced too! Cyclopentasiloxane, Paraffin, C11-12 Isoparaffin, Polybutene, Hydrogenated Cottonseed Oil, Simmondsia Chinensis Oil (Simmondsia Chinensis (Jojoba) Seed Oil), Ceresin, Ozokerite, Cera Microcristallina (Microcrystalline Wax), Tocopherol, Ascorbyl Palmitate, [+/-Mica, Talc, Calcium Aluminum Borosilicate, Polyethylene Terephthalate, Tin Oxide, Silica, CI 77891 (Titanium Dioxide), CI 77491 (Iron Oxides), CI 77492 (Iron Oxides), CI 77499 (Iron Oxides), CI 77510 (Ferric Ferrocyanide), CI 75470 (Carmine), CI 77288 (Chromium Oxide Greens), CI 77000 (Aluminum Powder), CI 77007 (Ultramarines), CI 77400 (Bronze Powder), CI 77742 (Manganese Violet), CI 42090 (Blue 1 Lake), CI 19140 (Yellow 5 Lake), CI 77163 (Bismuth Oxychloride), CI 77289 (Chromium Hydroxide Green). Make Up For Ever Aqua Eyes retails for $18. Which is quite expensive for a pencil, but I suppose it is a 2-in-1 liner and shadow so it might be more worth it. 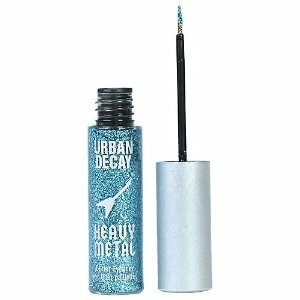 Urban Decay Heavy Metal Glitter Eyeliner is a sparkly eye liner designed to make you look like a rock star. It has a thin brush, so you can paint on a very precise line. The eye liner should dry quickly, once dry it should not smudge or flake. Heavy Metal Glitter Eyeliner comes in a wide range of colors so you should be able to find the perfect rock star color for you, if that's your thing? Geeta .K from mystyle.com says it is very sparkly but looks better when applied with an eye shadow. Alicia .G from mystyle.com says heavy metal glitter eyeliner goes on very easy but doesn't have a lot of pigment so looks better over a normal eyeliner. When applying, only apply one coat at a time and let it dry before applying the next coat. Else it might course the first layer to smudge or come off all together. Water (Aqua), Polyethylene Terephthalate, Propylene Glycol, Glycerine, Acrylates Copolymer, PVP, Daucus Carota Sativa Root Extract (Carrot), Prunus Persica Fruit Extract (Peach), Cucumis Sativus Fruit Extract (Cucumber), Polyurethane 11, PVM/MA Decadiene Crosspolymer, Disodium EDTA, Sodium Hydroxide, Pheonoxyethanol, Methylparaben, Ethylparaben, Butylparaben, Propylparaben, Isobutylparaben. If you want to look like a rock star you can buy Urban Decay Heavy Glitter Eye Liner for $18. Which is expensive compared to a lot of other brands. 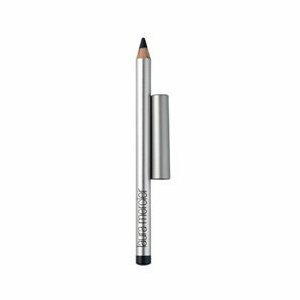 Slim Pencil Eye Liner by Sephora has been formulated to be a long wearing pencil that will define the eyes gorgeously, so Sephora says. There is lots of colors to choose from and they can be layered on top of each other or layered on top of an eye shadow. If you like to experiment with different shades of makeup, I suggest you at least take a look at the colors offered in this eye liner. Sephora offer some really gorgeous shades. Hydrogenated Palm Oil, Hydrogenated Coconut Oil, Hydrogenated Coco-Glycerides, Rhus Succedanea (Fruit Wax), Hydrogenated Vegetable Oil, Cera Alba (Beeswax), Simmondsia Chinensis ((Jojoba) Seed Oil), Tocopheryl Acetate, Tocopherol, Propylparaben, Stearyl Glycyrrhetinate. May Contain: CI 77019 (Mica), CI 77891 (Titanium Dioxide), CI 19140 (Yellow 5 Lake), CI 77499 (Iron Oxides), CI 42090 (Blue 1 Lake), CI 77491 (Iron Oxides), CI 77288 (Chromium Oxide Greens), CI 77492 (Iron Oxides), CI 77510 (Ferric Ferrocyanide), CI 77000 (Aluminum Powder), CI 77742 (Manganese Violet), CI 75470 (Carmine), CI 77007 (Ultramarines), CI 77289 (Chromium Hydroxide Green), CI 77163 (Bismuth Oxychloride). All shades contain:Hydrogenated Palm Oil, Hydrogenated Coco-Glycerides, Myristyl Myristate, Cera Alba (Beeswax), Tocopheryl Acetate, Allantoin. May ContainL: CI 77891 (Titanium Dioxide), CI 19140 (Yellow 5 Lake), CI 77492 (Iron Oxides), CI 77499 (Iron Oxides), CI 77491 (Iron Oxides), CI 77742 (Manganese Violet), CI 15850 (Red 7), CI 45410 (Red 27). 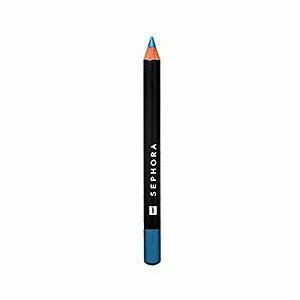 If you would like to try a Slim Pencil Eyeliner by Sephora your self it costs $3. I think this is a brill low price considering most brands charge way more for eye liners. 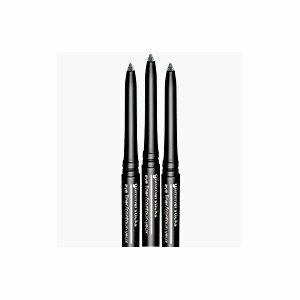 Avon Glimmersticks Eye Liner is designed to define the eyes while also being easy to apply. Avon says it made this eye liner for easy use so it has a easy glide on color with long wear, self sharpening and its retractable. Glimmersticks also come in a wide range of colors. I have a black one and it is really black not a greyish black like some brands. Unfortunately this eye liner isn't waterproof though, so you might want to look at other reviews if you need a waterproof one. Avon guru's on viewpoints.com think Glimmersticks eye liner is good as it lasts all day, goes on so smooth without tugging skin and the price is great. Some other ladies weren't as impressed as they found it to smudge and not last very long. 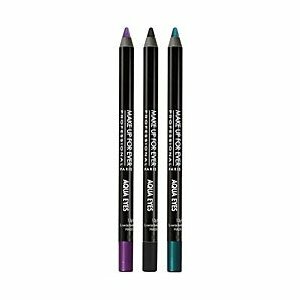 Avon Glimmersticks Eye Liner costs $2.99 as its on sale now, but normally costs $6. Which is still a great deal at full price and is cheaper than most brands. You are currently browsing the archives for the Eyeliner category.